1. What is a Short Code? Short Codes used for text messaging are either 5 or 6 digits long. They are easier to remember than normal telephone numbers. These numbers can be used for mobile marketing, reminders, information services, and more. 2. What is the difference between premium and standard text messaging? Standard text messaging is priced by each individual carrier. Its rate is the “base” price paid to send and receive text messages. Premium text messages carry an extra charge and in some cases are in addition to standard text messaging rates. This added fee ranges from $0.15 to $10.00. 3. How do I sign up for a text message subscription service? This must be initiated by you, the mobile phone user. It is possible that you might see a Short Code advertised on TV, on the radio or online. Follow the instructions provided. Usually the instructions are to text message a certain keyword or phrase to the Short Code or to enter your mobile number online. Depending on the type of program, you may be required to take additional steps to confirm your participation. 4. How do I opt-out of a subscription-based service? By texting the word STOP to the originating Short Code, you will receive one message confirming you have opted-out and will receive no further messages from the Short Code. If you are subscribed to multiple Short Codes, you must text STOP to each Short Code. Please note that the keyword STOP is not case sensitive. 5. How do I get more information about the text-messaging service? To receive more information, text HELP or INFO to the Short Code. This will result in a return message outlining: the program sponsor (program name, company name), a short description of the program, customer service contact information such as a website, email or toll-free phone number, cost and message frequency, and information about how to cancel the service by texting STOP. You can find a complete list of current text messaging programs and customer service information at: http://www.txt.ca/current-short-code-programs/. 6. What should I do if I feel that I’ve been charged for services that I didn’t sign up for? Contact your service provider to get the customer service information of the company running the service. They will be able to give you details about your account and the services used on your phone. 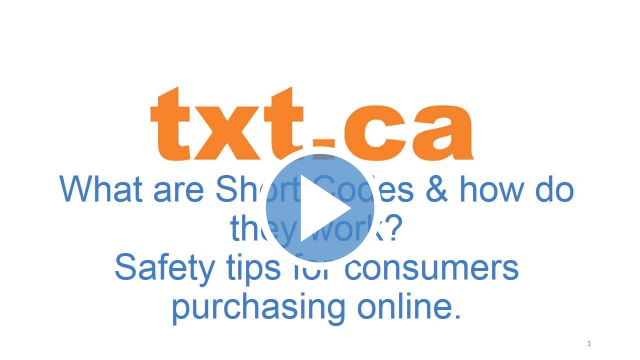 You may also refer to the following web site to find a complete list of current text messaging programs and the associated customer service information: http://www.txt.ca/current-short-code-programs/. If you have already contacted your service provider and the company running the text messaging service and your concerns have not been adequately addressed, you can contact the Commissioner for Complaints for Telecommunications Services (CCTS), an independent third-party complaints resolution service. Information about the CCTS is available at: http://www.ccts-cprst.ca or 1-888-221-1687. 7. I didn’t subscribe to this service, why am I receiving messages? Short Codes are all permission based, therefore, messages cannot be sent to a mobile number if the user has not agreed to receive the messages. You must “double opt-in” to premium services, meaning the content provider must double-check to make sure its services have been ordered. This is done so that someone cannot inadvertently sign your phone up for unwanted services. It is possible that mobile phone users may be given a number that used to belong to someone else. In rare instances, if a new mobile phone number is obtained, there is a chance that the former user may have subscribed to various text messaging services. Typically, carriers do not recycle numbers for a period of at least 30-60 days. Subscription services are required to remove unavailable clients from their contact lists. If you are receiving unwanted messages, text STOP to the Short Code or contact your service provider. 8. What if someone signs my phone up? Subscription based Short Code programs where opt-in is online, spoken, or written have a handset verification stage to prevent this occurrence. Premium text messaging services must double check to make sure their services are wanted. This is done to prevent a person from signing up someone else’s phone. 9. What if I forget that I have subscribed to a service? The name of the subscription service. The pricing and terms of the service. Instructions on how to unsubscribe from the service using the STOP keyword. Customer service contact information (email, web site address and/or toll-free phone number). 10. How private is my information? This should be mentioned in the terms and conditions of the text message program. All users must read all terms and conditions before agreeing to opt-in to any Short Code program. No. All Short Code programs are permission based. In order to opt-in or subscribe to a Short Code program, you must initiate the action either by sending a designated keyword to the Short Code, or by providing your mobile number online, over the phone, or on a paper form, acknowledging you wish to receive alerts via text message. For additional information regarding SPAM, and Canada’s Anti-Spam Legislation, please visit: www.fightspam.gc.ca. 12. What can I do if my service provider can’t resolve my complaint? The Commissioner for Complaints for Telecommunications Services (CCTS) is an independent organization dedicated to working with you and your service provider to resolve complaints relating to your telecommunications services. Email shortcodes@cwta.ca for more information. What are Short Codes & how do they work? Safety tips for consumers purchasing online. What is the difference between premium and standard text messaging? How do I sign up for a text message subscription service? How do I opt-out of a subscription-based service? How do I get more information about the text-messaging service? What should I do if I feel that I’ve been charged for services that I didn’t sign up for? I didn’t subscribe to this service, why am I receiving messages? What if someone signs my phone up? What if I forget that I have subscribed to a service? What can I do if my service provider can’t resolve my complaint?